In 1727, a prayer meeting began in a Moravian community led by Count Zinzendorf. It started with 24 men and 24 women covenanting themselves to pray an hour each day, day and night. This 24-7 prayer meeting carried on for 100 years and became the vanguard of the great Protestant missionary movement in the 18th and 19th century. Some even sold themselves as slaves to further the gospel. In the past, great transformation and revivals have been birthed through prevailing prayer. And we want to be part of God’s story. We want to see greater things happen in our time and watch. 24-7 Prayer seek to mobilize disciples into a covenant lifestyle of prayer, just like the Moravians did. We are community of people of prayer in action. We seek ‘to reconcile the world to God through Jesus Christ by mobilising prayer, mission and justice throughout the nation. You can come join us in prayer, or even start a 24-7 prayer crew/room in your neighbourhood or town. The rules are minimal. Sing, dance or draw. Stand, sit or kneel. We want you to engage with God through prayer as creatively as possible. Get your friends, school mates, cell groups, youth fellowships, church, denomination, school, campus or community together and set a week to pray 24-7! We would love to help you so do contact us ! Jesus focused on our relationship with God, who is our Father, and on His kingdom. When we talk about prayer, people tend to think it as just a way of practice as a Christian so that we can get our personal needs met. Often, we bring before God our “shopping list”, or perhaps, treat God like our teddy bear, or perhaps, quite often, our heavenly ATM – our auto teller machine! Jesus taught us that we should understand prayer as a relationship first. It is having a conversation with God, who is our Father. Enjoying each day telling Him how much we love Him, and sharing Him how our day was, and what our concerns are. And when we come to Him, we look forward to being in His presence, to listen to Him, to adore Him, to know what’s in His heart, and to be changed by Him. The better we get at being in a conversation with Him, the better we learn how to pray, and say sorry to Him. More importantly, we need to learn to repent and petition to God as His people. When we look at past histories of church growth and spiritual renewal, we see one common thread: a prevailing, intense and kingdom minded prayer where all of God’s children come together corporately, crying out to Him. We saw that in the Moravian revival, in South Africa, South Korea, Indonesia and closer to home, in Bakelalan. According to Rev Tim Keller of Redeemer Presbyterian Church, kingdom centred prayer is made of the 3 key ingredients. It is focused on God’s presence and kingdom. It is bold and specific. It is prevailing, and corporate. A request for grace to confess sins and humble ourselves. A compassion and zeal for the flourishing of the church. A yearning to know God, to see his face, to see his glory. For example in Acts 4, the disciples, whose lives had been threatened, did not ask for protection for themselves and their families, but only boldness to keep preaching! Pacesetters in prayer spend time in self-examination. They examine selves for idols and set them aside. that the world might see the glory of God through his people (Exodus 33:16). Moses asks that God’s presence would be obvious to all: “What else will distinguish me and your people from all the other people on the face of the earth?” (Exodus 33:16). This is the kind of kingdom minded prayer where people would be awed and amazed by a show of God’s power and radiance in the church – a sign of the kingdom to come. We begin to move away from the boring “maintenance” prayers and move towards building an altar that God can honor with his fire. 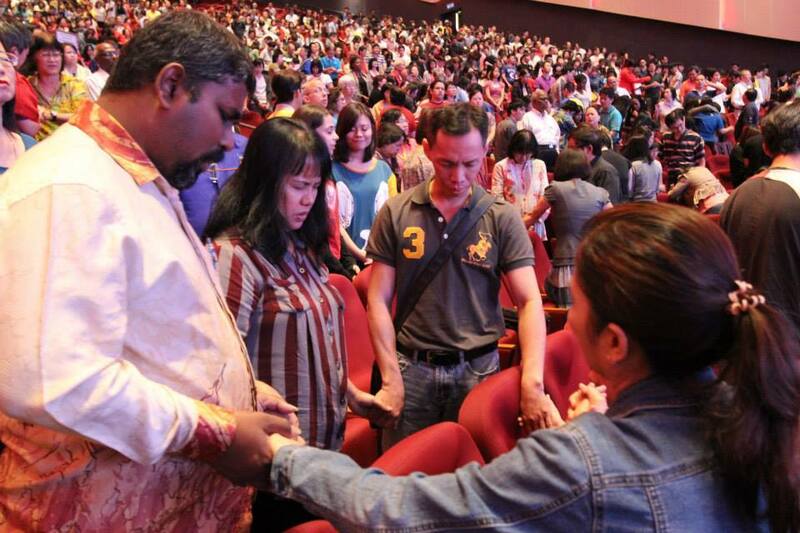 It is this sort of kingdom centred prayer that we in 247 Prayer Malaysia hopes to build into a movement of prayer without ceasing, prayer that’s long, prayer that’s hard, and prayer that holds on to God relentlessly until He blesses us. And in that very process it is this kind of praying that will bring about that which we are asking for — to have our hard hearts melted, to tear down barriers, to have the glory of God break through – in our personal lives, our family lives, in our church, and in our nation. How to pray for one hour ?